OM VISA Consultancy - Global Immigration, Students, Visitor, Business & Work VISA Consultants: Aiming for a visa to study in Canada? Here’s how you can boost your chances with IELTS...!!! OM International. Aiming for a visa to study in Canada? Here’s how you can boost your chances with IELTS...!!! OM International. 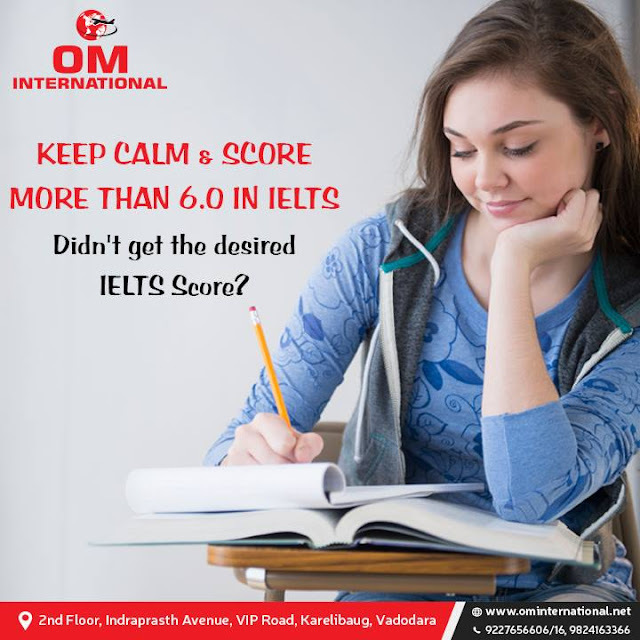 OM INTERNATIONAL, a pioneer in the field of 'GLOBAL EDUCATION' dispels all the myths usually associated with 'Study Abroad' and has brought the concept of overseas education to the doorstep of every student, by making it affordable & devoid of cumbersome procedures. Its excellent network with the Universities and Colleges across the globe helps us to deliver our best services to our students. Om International is a solution-oriented company, with a single mind approach in tailoring career paths to suit individual profiles within the parameters that may prevail in each case. The parameters may be educational, financial or personal. OM INTERNATIONAL is a finest Visa consultant having expertise in providing quality solutions in visa processing. We are world’s super visa specialist and are assisting people in, fulfilling their dreams of going and setting abroad. With most nations accepting immigration requests in more significant numbers from developing countries such as India, Canada stays the highly desired hot country, both for students and professionals. Thereby IELTS that has expanded its reach across institutions all over the world is taken with utmost significance. There are millions of candidates applying for the IELTS test every year while only a few of them succeed in qualifying. Furthermore, preparing for IELTS could get difficult if basics aren’t followed from the scratch. While not all institutions may ask for IELTS score for candidates wanting to study in Canada, the exam can certainly increase your chances to get through the best institutions. If you are about to appear for the exam, here’s what you must be doing to score well. More than just cramming the expanded form (International English Language Testing System) go more in-depth and understand the different components and the value of each. Try to decode the objective behind conducting such an exam and why is it so widely accepted. The agenda here is to get in sync with the expectations your targeted country holds from the applicants, their local environment and the extent to which you may need to hold on to your communication basics. Just a run through the basics from the IELTS website and the trends so far would suffice. Most applicants commit an error by ignoring professional guidance and attempt the exam by a tentative preparation few days prior. A professional coaching institute would nourish your basics and help master the subjects by focusing on the details. Not to miss, consistent practice through extempore tests and letting experienced instructors challenge you, is way more effective than brainstorming with the concepts alone. A reliable IELTS coaching institute is well versed with the possible variations in the questionnaire, making accurate predictions and guide you to prepare optimally. Look out for an institute that has proven results! IELTS is demarcated into four modules – Reading, Listening, Writing and Speaking. A good speaker may not be a good writer, and that’s the motive behind detailed classifications. That is, the council wants you to attain perfection in all areas so that the best candidates can be selected. Identify your weakest area and devote more time to it. Let your IELTS instructor assist you with more exercises and upscale your performance levels with regular feedback session with consistent practice through variety of materials. The following few additional exercises can help improvise upon your targeted subject. One of the oldest techniques to improve reading and speaking skills, reading out loud helps reduce fumbling, increase browsing efficiency and thus attain perfection in inter-personal communication. Read the newspaper in an appropriate pitch such that you don’t end up making noise while staying audible in the room. As a regular practice, avoid reading in mind for a few weeks. So be it any text you come across including signboards, newspapers, blogs and even textbooks, maintain the lowest volume but don’t stop speaking. Post a month of rigorous reading practices; you’ll notice a remarkable difference in your speech. This habit helps refine your reading as well as speaking skills. 15 minutes a day are sufficient. Although your IELTS trainer would be instructing you on new issues every day in essay writing, if you lack the necessary vocabulary implementation, you may ask for additional exercises. One good way would be asking your trainer prepare chits for topics that you can take home, pick one every day and start writing. In IELTS, the key to scoring high in writing is the innate skill to think fast and write on any topic given in hand. So, more than just learning complex words focus on writing more on different topics so that your ability to curate content gets faster. One of the most common reasons for minor marks in writing is the practice done on computer systems. IELTS continues to conduct writing exams the conventional way, where there is no automated spell check helps. Word processing tools in computers aid the writer with automated spell checks and such dependency reduces a writer’s organic capacity to memorize accurate spellings. While preparing for IELTS, always practice on physical sheets without any digital help. Post completion of the task, get the sheet evaluated by the trainer. Nothing fluctuates your IELTS score more than the Listening module. It is a common notion that any candidate can improvise upon reading, writing and speaking skills with time but listening is a fundamental ability to communicate in a foreign land. So, beyond the usual listening exercises in your IELTS classes, you can uplift the skill more by switching to international content such as songs and videos. Listen to interviews, speeches, and even film scenes to clearly understand the differences in the Indian and foreign accent of pronouncing words. IELTS will grow and so will the difficulty level increase with the number of applicants increasing. There’s nothing like starting asap, and that’s what you ought to plan. Going ahead with your plans to study in Canada, these tips will surely land you an impressive score and ultimately a reputed college. 2nd Floor, Indraprasth Avenue, VIP Road, Karelibaug, Vadodara.